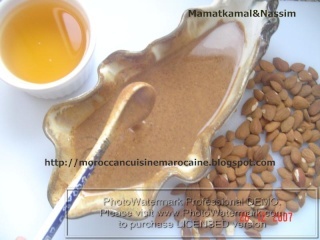 Moroccan Cuisine Marocaine: أمْلُو /How to make Amlo Paste? / Comment préparer Amlou? Amlou de la région de Souss-Sud du Maroc (Pâte à tartiner à base d'huile Argan)! أمْلُو /How to make Amlo Paste? / Comment préparer Amlou? Amlou de la région de Souss-Sud du Maroc (Pâte à tartiner à base d'huile Argan)! Traditionally in Souss region, to make Amlo, almonds should be reduced to a fine smooth brown paste in an old traditional grinding mill called "Arhaa"-See picture below-, which grinds almonds into a golden brown dough. However, for this recipe, I used a food processor, but the old way to make Amlo is still my favourite texture, it is smooth and delicious, absolutely stunning! To make Amlo, you need Argan oil, the most expensive oil in the world, and which is native to specifically south of Kingdom of Morocco. Argan tree is considered to be one of the rarest species of trees in the whole world and it is called "The Tree of Life" or "Miracle Tree Oil". Argan trees spread through thousands of hectares in the south as Agadir, Awlouz, Essaouira, Ihahan, Tarodant, Tiznit, Chichaoua etc... Surprisingly enough, Morocco is one of the only places in the world to obtain the nuts to make Argan oil. Even within Morocco, you cannot find Argan tree in the north, east or west! Some people tried to plant it in Spain, France, some parts of Morocco, but for some unknown reasons, it did not grow. So many research studies were done on Argan tree to discover its secret and it becomes so precious and so expensive that UNESCO declared a few years ago that "800,000-hectare area in south-west Morocco between Essaouira and Agadir a biosphere reserve because it is the only place in the world where Argan tree grows. Argan oil is also considered as a skin and beauty oil, since it is packed with natural vitamin E. Argan as beauty oil is white and transparent because the seeds are not toasted while the Argan oil for cooking has a beautiful golden brown colour. If you intend to try Argan oil for cooking, make sure to buy the one used for culinary purposes and not for cosmetic use. It is also important to remember that Argan oil for cooking does not last too long. Argan oil and Amlo are difficult to obtain outside south of Morocco, but you may order them on-line or via other suppliers (free trade). But be alert on fraud sites and make sure you are buying 100% pure organic Argan oil. There is no reason for you to spend a lot of money on an expensive product as Argan oil either for cooking or for beauty skin/hair and it includes other different ingredients nothing to do with the original product. An other important thing I would like to add is always make sure when you order Argan oil on-line, that it is produced by a Women’s Cooperative (Profits are shared among the local women of Souss region). Of course, you have an other alternative to get the real thing, which is go and visit Morocco yourself to get it, but you have to go the SOUTH (Agadir or Essaouira or Ihahan or Awlouz or Taradounat etc....), and you'll pay three or four times less the price than if you buy it abroad. Unfortunately like any expensive product, there is imitation Argan oil out even in the south of Morocco and all over the world. There are so many companies in Europe selling Argan Oil (In France, Spain, Germany, etc....). So first thing to bear in mind is NEVER buy Argan oil outside Morocco, or in any part of Morocco, except in Souss. Even if you travel to the south, make sure never to buy Argan oil in local souks or beauty shops or supermarkets as "Marjane, Metro, Aswak Salam" etc..... , in these places, you might get the counterfeit version of Argan oil instead of the real oil sourced from cooperatives. The fake version of Argan oil may contain a bit of the real oil, diluted with sunflower and even some paprika or food colouring. The best thing to do, is go directly to the cooperatives yourself and get the pure product. But if for some reasons, you can't, then ask someone you know well and who speaks south Imazighen language to get it for you. It is very important that the person is south Imazighen speaker because most women in Argan cooperatives or sellers don't speak Moroccan darija. Believe me, speaking south Imazighen makes a great difference when it comes to visit the south, trying to buy some precious items such as pure argan oil, olive oil, honey, saffron etc..., since all the sellers are Moroccan Swassa, so speaking their language makes the contact with them easier, thus you'll be easily trusted, allowing you to have a great bargain. 1-Smell the oil, if you are familiar with the strong, unique scent of Argan, you can't be mistaken. 2-Ask to try a sample. Argan oil is light and dry when compared to other oils. Rub a tiny bit on your hand, and after 30 minutes or 1 hour, check your hand, and if the oil absorbs into your skin, then it is pure Argan. If your hand is still oily, then this "Thing" you bought is anything but Argan oil. 3-Pure Argan for cooking does not last too long, so if you don't use it on a regular basis, put it in the fridge and add a pinch of salt in it, thus it will last longer. 4-Storing Agan in the fridge also tells you if the oil is pure or not, if it becomes hard, then it is a pure and the more it congels the purer it is. 1-Preheat the oven to 100°C. / Préchauffer le four à 100°C. 2-Rinse the almonds in cold water and allow them to drain for a few minutes./ Laver les amandes avec de l'eau froide et laisser égoutter quelques minutes. 3-Prepare a baking pan and add the almonds to the pan and generously sprinkle salt over the almonds. / Placer les amandes dans une plaque allant au four puis saupoudrer-les généreusement de sel. 4-Roast the almonds in the hot oven for about 15 to 20 minutes, or until the almonds have barely darkened. 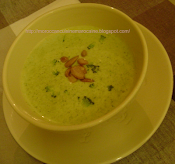 While they are roasting, however, as they burn easily, stir frequently to ensure even cooking of your batch of almonds. You might also use a flat based frying pan to roast the almonds on a stove if you wish. / Faire griller et dorer les amandes pendant environ 15 à 20 minutes ou jusqu'à qu'elles soient bien dorées. Il faut remuer constamment pour éviter de brûler les amandes et aussi pour obtenir une coloration uniforme. Vous pouvez aussi utiliser tout simplement une poêle à sec pour griller les amandes. 5-Let cool for about 15 minutes. / Retirer du four et laisser refroidir environ 15 minutes. 6- Place half of almonds and half of Argan Oil into a food processor or blender and pulse several times for about 5 minutes. / Dans un robot culinaire assez puissant, verser la moitié d'amandes et la moitié d'Argane, puis mixer pendant environ 5 minutes. 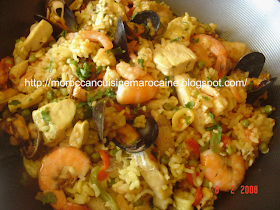 (Traditionnellement au Maroc, on prépare Amlou avec le moulin manuel qu'on appelle Ar7a ou Arha, mais puisque j'en ai pas un malheureusement alors j'utilise tout simplement un robot culiniare). 7-Add remainder of almonds and Argan Oil and grind them to the texture you prefer. This may take 10 minutes or more. / Ajouter le restant d'amandes et le restant d'Argane puis continuer à mixer encore 10 minutes ou jusqu'à obtention d'une pâte bien lisse. 8-Now pour this lovely mixture over a large bowl and add in honey one tablespoon at a time stirring well. / Maintenant, verser ce beau mélange obtenu dans un grand bol puis ajouter le miel une cuillère à soupe à la fois, puis bien mélanger le tout. 9-Amlo will keep for two months. Store Amlo tightly in a sealed jar. / Conserver Amlou dans un pot hermétique à température ambiante jusqu'à 2 mois. 10-Always shake or stir before serving Amlo . / Toujours bien remuer avant de servir Amlou. 11-Serve for Breakfast and enjoy! / Servir pour pour le petit déjeuner et Bssa7a w ra7a! So fun to learn about new foods and processes. What an amazing sauce. This is all new to me. I must re-read your post. So full of new info. labas 3lik? Thanks for delicious recipes! I will follow u inshaallah! That sounds and looks delicious! A fabulous paste.